Located in the heart of Gettysburg – town center’s circle. Since 1797, guests of the Gettysburg Hotel have enjoyed the warmth and graciousness of our attentive service. From the moment you step in the door, you are welcomed into a world of hospitality reminiscent of another era. For nearly two centuries, the Gettysburg Hotel has played host to prominent national and international figures. Distinguished names such as President and Mrs. Dwight D. Eisenhower, Carl Sandburg, Henry Ford, General Ulysses S. Grant and Daniel Webster have enjoyed our attentive hospitality! Located in the heart of the historic district the Gettysburg Hotel provides the perfect location to explore this exciting area. You can walk to many famous landmarks and special attractions from this newly reconstructed historic landmark where past traditions are richly blended with the comforts of the most modern amenities. 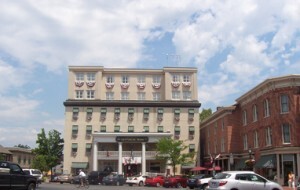 The Gettysburg Hotel is a six-story interior corridor hotel. Spacious, comfortable, double-occupancy guest rooms are equipped with private bath, 2 full-size beds, remote control TV with over 60 cable channels, desk, telephone, hair dryer, alarm clock, coffeemaker, iron & ironing board, and comfortable chair. All linens are provided and serviced daily. Their facilities offer meeting and banquet rooms, a fine dining restaurant, a cozy tavern and a seasonal relaxing outdoor pool. Laundry service is available. All guestrooms and public areas are accessible by elevator. Complimentary safety deposit boxes are available for your valuables at the front desk. The Hotel is non-smoking and handicapped rooms are available. Requested singles are available for an extra charge.